This briefing was prepared by the Convention for Higher Education (CHE), a non-partisan group of academics drawn from across the university sector. 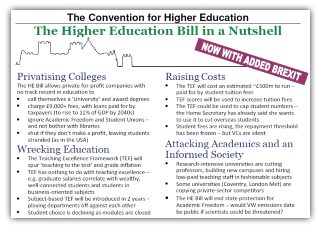 The CHE is deeply concerned by the damage that this bill would do to Higher Education across the UK. We appeal to all members of the Committee actively to seek, and forcefully to support, appropriate amendments to the Bill for the reasons laid out below. The Bill says little about TEF, but one of its central purposes is to create the enabling institutions for it. Given its centrality, it is alarming that the TEF is not being subjected to properly parliamentary scrutiny or ongoing oversight, but is instead being developed via a separate technical consultation. The TEF would involve measuring and grading university teaching in a similar way to university research (the Research Excellence Framework, REF), with higher TEF scores driving higher fees, though capped at inflation. Since decades of educational research has failed to develop any reliable measurement of teaching quality, there will be a heavy reliance on crude metrics. Whatever metrics are eventually used, TEF will inevitably incentivise not excellent higher learning but rather ‘teaching to the test’. For example, the government is currently trialling examinations to measure students’ overall ‘learning gain’. If this becomes the metric for teaching excellence, universities will inevitably start coaching students on how to ace ‘learning gain’ tests. The metric will cease to measure real learning outcomes and existing subject curricula will be hollowed out, as academics are forced to turn over class time for this purpose. Students will thus learn less, not more. Other proposed TEF metrics – notably student satisfaction – have similar pitfalls. Student ‘satisfaction’ is affected as much by the quality of student accommodation, sports clubs and bars as by teaching. Incentivising universities to boost ‘satisfaction’ will likely compel the redirection of resources away from teaching to these peripheral facilities. Moreover, academics will be discouraged from designing difficult, challenging courses or grading fairly, for fear of making students ‘dissatisfied’. Course content will be dumbed down and grade inflation – already endemic – will escalate sharply, devaluing degrees. Again, introducing TEF will mean students learn less at university. Moreover, as academics are increasingly held accountable for students’ learning outcomes, students’ sense of responsibility for their own learning – historically a core aspect of higher education – will diminish. We are already seeing students dissatisfied with their grades suing their universities. If the TEF is introduced, an ancient system of independent student, guided by subject experts, will be supplanted by spoon-feeding – as seen in our secondary schools thanks to the rise of metrics and league tables. The result will be less independent, less resilient and less responsible graduates who are less useful employees and less capable of assuming the responsibilities of citizenship. A major opportunity offered by Brexit is to review and reduce the burden of red tape facing all UK institutions. Yet this bill proposes additional and wasteful bureaucracy. The existing ‘quality assurance’ regime for UK universities already costs us £1.1bn annually, 8 percent of the teaching budget. Despite the Bill’s talk of ‘light touch regulation’, in reality the TEF will be costly and burdensome, as universities develop internal bureaucracies and processes to ‘game’ the system. The 2016 Stern Review noted this practice around the REF, the cost of which was conservatively estimated at £246m in 2014. TEF bureaucrats have already been hired at several universities and many more will follow. Crucially, the TEF’s costs will be borne by universities themselves, which will be forced to pass on these costs to students and their families. And, since even the highest TEF scores will only allow fee increases equal to inflation, even the best universities can only hope to maintain their real-terms income. Subtracting the costs of TEF results in a net loss. Thus, despite rising fees, universities will actually have less money to devote to improving teaching. This will accelerate a tendency within universities, caused by government policy, to reallocate scarce funds to peripheral functions like marketing, spending on which rose 33% from 2010-11 to 2012-13, to over £36m. The TEF is also entirely wasteful because there is simply no solid evidence that UK university teaching is of such poor quality that additional regulation is needed. Although it is widely alleged that universities prioritise research over teaching, statistical analysis shows no correlation between the best research universities and low scores in the annual National Student Satisfaction Survey (NSS). The Higher Education Funding Council for England reports that NSS scores have ‘increased steadily’. Research by the Department for Business, Innovation and Skills (BIS) found that employers were ‘mostly satisfied with the graduates they had hired’. Research for the European Commission also ranks UK Higher Education as first for teaching, research, and value for money. Despite systematic underfunding, the UK university system is world class, second only to the United States. The bureaucratic government regulation of teaching is unnecessary and will only stifle existing excellence and creativity. Conversely, the Bill proposes extremely weak regulation where it is most necessary: the protection of students. The Bill’s primary purpose is to marketise higher education by facilitating both the entry of private providers and market ‘exit’ by universities – i.e. their closure, whether voluntary or forced (e.g. by bankruptcy). Enrolled students whose institutions ‘exit’ risk severe disruption to their education and their lives, particularly if they have relocated to study. Moreover, heavily indebted graduates risk being left with poor-quality degrees, awarded by defunct institutions that employers do not value or recognise. This has already occurred widely in the US. The 2012 Senate report, For Profit Higher Education: The Failure to Safeguard the Federal Investment and Ensure Student Success, condemned the rise of ‘sub-prime’ private providers, which encouraged often-incapable students to take out state-backed student loans to enrol on their substandard programmes. The Bill’s proposed protections for such individuals are grossly inadequate. Providers will merely be required to have an entirely unspecified ‘student protection plan’ (§13(1)(c)) approved by the new Office for Students (OfS) – whose primary remit is not consumer protection. Reflecting its world-class status, despite minimal government investment, UK HE is currently world-renowned. It boasts 4 of the world’s top 10 universities, 5 of the top 20, 10 of the top 50, and 58 of the top 500 (THE), attracted 436,585 overseas students in 2014-15, and generated estimated export revenues of £10.7bn in 2011-12. The Bill threatens to destroy this enviable position in two ways. First, as a ranking system, the TEF will inevitably identify ‘winners’ and ‘losers’, with the result that some UK universities will be branded as providing ‘poor’ teaching relative to others, even if their teaching is objectively excellent. This will send a terrible message to prospective students, particularly those overseas: that many of our universities, and our university system as a whole, do not provide high quality education. The sector has already suffered from entirely baseless comments by the responsible Minister about ‘lamentable’ teaching. TEF would further ‘talk down’ our universities. The government’s stated aim to expand educational exports to £30bn by 2020 will obviously be frustrated. Secondly, the entry of poorly regulated private providers will devalue degrees and leave many graduates with ‘sub-prime’ qualifications. In 2015, UK HE’s Quality Assurance (QA) system was significantly weakened, explicitly to permit ‘different conceptions of “quality”’, to be determined by providers. The Bill further lowers the hurdle for private companies to attain the title of ‘university’, and provides no detail of the quality standards to be overseen by the OfS. We therefore anticipate the enabling of private providers to provide low-quality, cut-price degrees in cheap-to-provide areas where they can undercut established universities and attract fee income from state-backed student loans. As stated above, in the US, this approach has left hundreds of thousands of heavily indebted graduates with ‘sub-prime’ qualifications, unrecognised by relevant employers. The ease with which private providers can ‘exit’ the market makes it easy for them to cut and run, while graduates will be left carrying the burden for life. Replicating this scandal in the UK will grossly damage the global image of our university sector and its economic contribution. Reducing the government deficit is a top UK government priority, yet easing the market entry of many private providers in HE is highly likely to destabilise government finances. The shift to £9,000 fees has already weakened the government’s long-term finances: since it is anticipated that around 40% of student loans will never be repaid, a huge asset write-off will occur in the late 2040s. The poorly-regulated entry of private providers has also already caused chaos in short-term government finances. In 2013, a sudden influx of private providers, which deliberately over-recruited, led to a trebling in their funding to £175m which, combined with austerity cuts and ‘resource accounting and budgeting’ pressures associated with student loans, produced a £1.4bn shortfall in the BIS budget. BIS was forced to suspend the ‘designation’ of 22 private colleges and halt all support funding to EU students, as well as abolishing maintenance grants and slashing in-year and future support for Science, Technology, Engineering and Mathematics teaching. In 2015, the Public Accounts Committee condemned BIS for pressing ahead ‘with the expansion of the alternative provider sector without sufficient regulation in place to protect public money’. Yet, the temporary restrictions on private providers have since been lifted, and further expansion is now actively sought – again, without any real safeguards in place. In the US, again, this approach has been calamitous. The expansion of private providers has in part been responsible for the near-tripling of total student debt over the past decade to US$1.3 trillion (£1.01tr). Historically, the federal government has directly sequestered debt repayments from pay packets, but as the ‘sub-prime’ education scandal has mounted, pressure for state-backed debt relief is growing. In May 2015, following a US$1.1bn (£853m) court fine for fraud, Corinthian Colleges filed for bankruptcy, closing 91 colleges and leaving 110,000 students deeply indebted, without courses or degrees. In June, the federal government announced it would forgive the loans of Corinthian’s defrauded students, with a possible cost of US$3.5bn (£2.7bn). Another ‘sub-prime’ scandal is ongoing in Australia, with ‘dodgy’ vocational education providers offering individuals inducements like free laptops to enrol on courses they had no intention of taking, costing the state an estimated AU$4bn (£2.4bn) in 2015 alone. We fear that this bill is a recipe for fiscal disaster in the UK. Parliamentary oversight of student fees and the allocation of state support must be restored urgently. The Bill’s premise is that intensifying competition between HE providers will drive up standards. In reality, the reverse is more likely. Private providers’ strategy so far – which will likely continue – has been to ‘cherry pick’: to focus on a few cheap-to-provide, low-quality, vocational degrees and entry-level courses like Higher National Diplomas and Certificates. To undercut established universities, these companies also cut costs by neglecting to provide many of the basic facilities of normal universities, such as libraries, student unions and their associated welfare and social services. They also employ staff on inferior and teaching-only contracts, providing no time or resources for research or scholarship. Established, multi-faculty universities cannot possibly compete with such a business model. To survive, many will have to become more like the private providers, stripping back course provision to profitable areas and cutting services to students, including the closure of infrastructure established by past public funding. This will result in the closure of many courses, degree programmes and departments. This trend is already apparent at distressed institutions like London Metropolitan University (LMU), which abolished half of its degree programmes in 2011 and is currently seeking to close two of its three campuses and make redundant one-third of its staff. But the impact will be felt across the entire sector. Currently, universities can use surpluses from relatively cheap-to-provide subjects (predominantly in the humanities and social sciences) to cross-subsidise subjects that are costlier (predominantly STEM) or less popular (e.g. languages). If private providers cherry-pick cheap-to-provide courses, this cross-subsidisation will be rendered impossible. Thus, intensified competition does not drive up standards: bad will drive out good. LMU once had more British Black and Minority Ethnic students than all 27 members of the Russell Group combined. Under growing private-sector competition, its student base has shrunk from 30,000 to a predicted 10,000. This decline, and its potential destruction, deals a terrible blow to government aspirations on widening access to HE and social mobility. Cross-subsidised STEM and languages subjects are central to delivering economic growth in an era of hi-tech industry and globalisation, but the influx of private providers has already compelled a cut in support for STEM, and internal cross-subsidisation is now under threat. 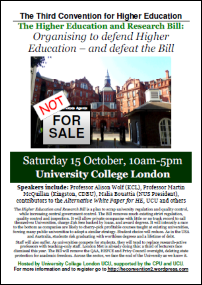 Universities’ stripping back of non-profitable functions in order to compete with private providers will undermine the broad and pro bono social provisions of universities, such as public engagement activities, cultural events, free legal clinics, adult education, and other work with local businesses, charities, museums, schools, and community organisations. This not only violates the spirit of the ‘big society’; it will have real social and economic costs for local communities. The closure of courses, departments and entire universities will leave some areas and possibly whole regions without universities offering a broad range of subjects. This would not only reduce choice for students – contrary to the Bill’s stated intentions – it will compel many students to relocate for study, increasing their costs. Closure of parts of and whole universities will also devastate local economies. In 2011-12, UK universities accounted for over £73bn of output and 2.7% of total employment; in many constituencies they are the largest single employer after the NHS. This entry was posted in HE BIll, Uncategorized and tagged higher education, Office for Students, TEF. Bookmark the permalink.